The Seven Years’ War (1756–1763) is the name given to the last great conflict involving all the major powers of Europe, except Turkey, before the French Revolutionary Wars. Described as the first truly „world war“ it was fought partly in Europe, where Frederick the Great’s Prussia, aided by Great Britain, electoral Hanover, Hesse-Kassel and Brunswick challenged the combined might of Austria, France, other German states and Russia. The global context of the war refers to the so-called French and Indian War, which broke out in North America between the French and the British before 1756, and the continuing hostilities of that period between the French and British East India companies. In fact, whereas the main belligerents in the Seven Years’ War were Austria and Prussia, it is possible to regard the Franco-British confrontation in Europe as well as the Spanish entry into the war and the consequent Portuguese involvement, as merely by-products of the colonial struggle. John Mollo, the well-known expert on military dress, discusses the campaigns of the Seven Years’ War and describes the uniforms and equipment worn in such famous battles as Roßbach, Leuthen, Minden, Kunersdorf and Warburg. In North America, Braddock’s defeat on the Monongahela in 1755 and Wolfe’s victory at Quebec in 1759 are given special emphasis. Malcolm McGregor, the illustrator, is now widely recognised as an outstanding military artist and in this, his third Blandford uniform book, his magnificent colour paintings are again based on actual people of the period. 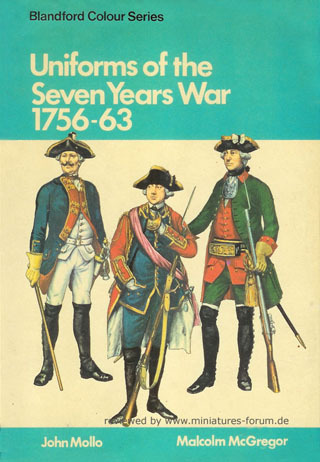 Uniforms of the Seven Years’ War is a comprehensive resource for figure painters, diorama builders, and wargamers interested in raising Seven Years’ War armies for the major and minor belligerents in the Seven Years’ War. The Orders of Battle included in the appendix list battalions and regiments of the armies engaged at Roßbach, Leuthen, Minden, Kunersdorf, Quebec, and Warburg. Malcolm McGregor’s illustrations are based on portraits of actual people of the period, like Frederick the Great, Major-General von Seydlitz, Herzog Ferdinand of Brunswick-Wolfenbüttel, Prince Xavier of Saxony, Marshal Soubise, Lieutenant-General Francis de Chevert, General Laudon, Field-Marshal Prince Charles of Lorraine, Graf von Schaumburg-Lippe, Colonel George Washington, Major-General James Wolfe, Vice-Admiral Sir Charles Saunders, and Major-General the Marquis de Montcalm, among many others. There is a list of uniform and facing colours of Reichsarmee infantry and cavalry regiments which serves as a good starting point for further research into the subject. Some of the entries are incomplete, and may be misleading, because they refer to converged regiments like Kürassier-Regiment Kurpfalz or Infanterie-Regiment Kurbayern with different facing colours within the same formation.